Those who have been reading Definitive Gear for a while now know that we love Philips Hue. It was our first review published, followed by any new additions. 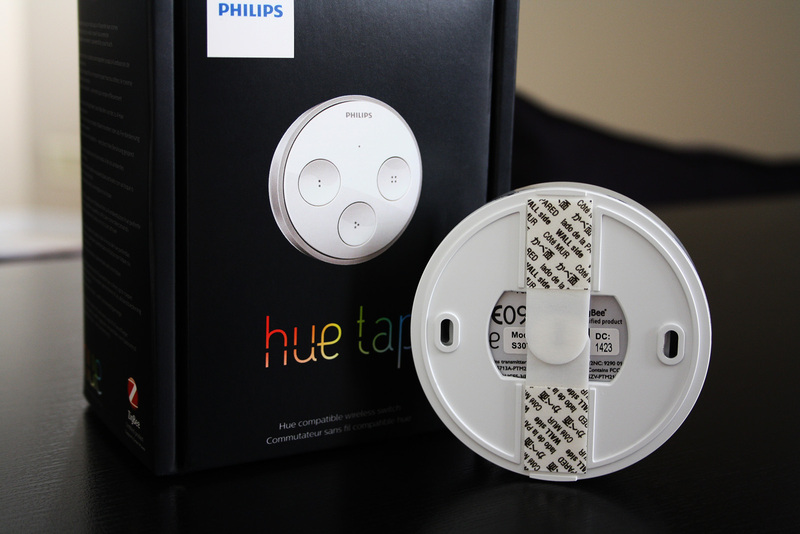 The Philips Hue Tap and Lux accessories were first unveiled in March. We’ve been waiting a while for the Tap, and it’s finally arrived. My first thought as I was handed the box was this thing is tiny. It’s much smaller than I anticipated from viewing promotional material and videos. I measured it up against a standard hockey puck and it’s the exact same diameter and height. Another surprise that I discovered after taking it out of the box is that it does not require batteries. The unit powers itself from pressing the buttons. Registering a click for the first time took a few tries to get right. I found myself pressing the button too quickly. If you press it down in a firm motion it works every time. There’s a distinguishable click sound that you can hear, which coincides with the way it’s powered. The Philips Hue Tap can be handled as a wireless remote or mounted to a wall. On the back you’ll find two adhesive strips and integrated mounting brackets if you’d prefer to use hardware. I plan to keep it as a loose remote so that it can be passed around the room or readily available near the front door. Up to 25 Taps can be assigned to each Bridge, so for those who wish to utilize it as a fixed wireless light switch are able to mount one in each room. This works well if you have a more intricate system. Considering that 50 lights can be paired with each Bridge, those who have 2-3 lights per room in each section of their house can manually designate lights to each Tap. If you affix a Tap to the wall in a bedroom, you can customize specific scenes to control only the lights in that room. It’s a unique way to have a different atmosphere in each section of your home. Setting up the Philips Hue Tap is very simple. The Settings menu located in the Hue app will present you with an option to Connect New Devices. After holding the middle button on the Tap for 10 seconds, it activates and will be automatically detected. From there, you can use a touch interface to select which scenes to pair with each button. Custom scenes can also be selected alongside the default ones. Once the 4 buttons have been assigned, hit Save and it’s all set. The app updates in real-time when each button is pressed. It will display which button was selected and how recent. As with all the Hue lights, you have the option to rename it. The default name is Hue Tap 1, and I simply removed the 1. I only have one Tap and don’t currently plan to get another in the near future, as all of my lights are located in my main room. Once I expand my Hue collection to other rooms, having another Tap would be a good investment. Philips implemented cloud syncing into the Hue app, so any changes made on iPad or iPhone will sync to the other device. I had initially set up the Tap on my iPad. When I opened my iPhone a few minutes later, it was already updated and ready to go. The response time of the Tap is better than I expected. The lights change scenes instantly after each tap with no noticeable delay. It’s an exciting event whenever Philips unveils new Hue products. 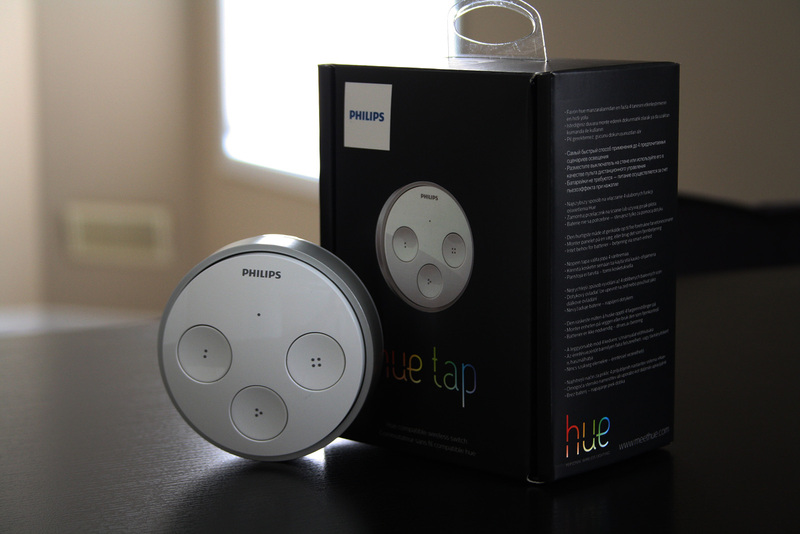 As a Hue fanatic I would have purchased the Tap regardless of the situation, although it’s nice to skip the process of opening up the app to simply turn the lights on. Having the ability to customize specific scenes to each button is a great addition as well. I’m very impressed with the Tap, and look forward to what they have in store for the future.